First Camino painting is up for sale!!!!! 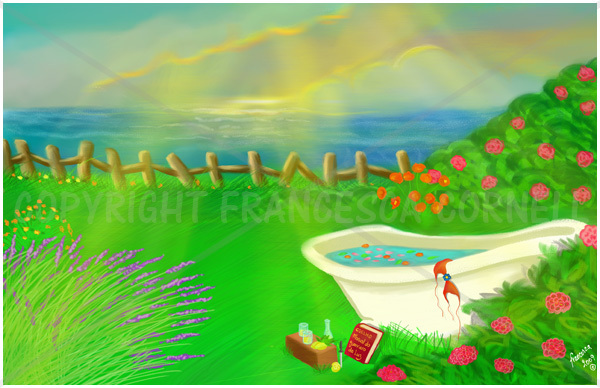 Dreams inspired by Nature’s bounty, the unpretentiousness of homemade limoncello, oceans and the seas, the play of morning and late afternoon light on blue waters, an old farmhouse claw foot tub for a pool, french lavender from Provence, and wildflowers, California orange poppies… a broken fence.. tall green grass… a book to inspire… pastel colored clouds… Limited edition! Only 100 digital copies will be sold in this size! Click on the Buy Now Button and Pay securely through Paypal! Please amke sure you provide a valid email address for me to send you your copy! Corel Sketch Pad, Adobe Photoshop CS4 extended, Wacom Intuos 4 Graphic pen Tablet.